Episode 131 – Fragile complete album live? Really? 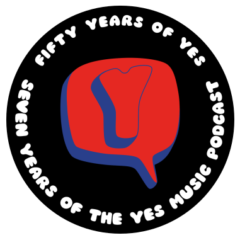 The one hundred and thirty first episode of the Yes Music Podcast, featuring some thoughts about how the solo tracks on Fragile might be presented live in 2014. How can Cans and Brahms be attempted? Should the band bother with Five Percent for Nothing? Listen and see if you agree with me, then let me know via any of the methods below. Author KevinPosted on April 25, 2014 October 12, 2016 Categories Episodes, YMP Classic FeedTags @notrightaway, @VideoTim, Alan White, album, Bill Bruford, Chris Squire, classical, episodes, Fragile, Geoff Downes, Jon Anderson, Jon Davison, live, orchestral, Rick Wakeman, Steve Howe10 Comments on Episode 131 – Fragile complete album live? Really? …brought to you by the letter, ‘O’. The one hundred and fourth episode of the Yes Music Podcast, featuring some interesting tracks, facts and concepts beginning with ‘O’. Listen and see if you can spot any letter ‘O’s I have left out, then let me know by contacting me via any of the different routes on the right hand side or by leaving a comment below! Which albums and tracks begin with the letter, ‘O’? Which instrument has the closest ‘O’ relationship with classical music? Which band member has the most ‘O’ levels (no, not really). …brought to you by the letter, ‘N’. The one hundred and first episode of the Yes Music Podcast, featuring the Yes Alphabet – ‘N’. Listen and see which letter ‘N’s I have missed, then let me know by contacting me via any of the different routes on the right hand side or by leaving a comment below! Nostalgia’s not what it used to be – or is it? New Age – is that relevant? What is the connection between Yes music and Star Wars? …brought to you by the letter, ‘M’. STOP PRESS – before I get lots of messages, I now realise that I have missed Patrick Moraz out of the ‘M’ Alphabet episode. Oops. I will add him in next week! The ninety-forth episode of the Yes Music Podcast, featuring the Yes Alphabet – ‘M’. Listen and see which letter ‘M’s I have missed, then let me know by contacting me via any of the different routes on the right hand side or by leaving a comment below! What musical instruments beginning with ‘M’ made a big difference to the Yes sound? What albums and tracks begin with ‘M’? What about the ‘M’ in ‘MTV’? Please send an audio message to the show via any of the methods on the right hand side of the website. You don’t have to say anything elaborate or clever – unless you want to. Just give your name (first name alone is fine if you want) and where in the world you are. Many thanks! I look forward to receiving your audio clip to play on the 100th show! The eighty-forth episode of the Yes Music Podcast featuring several different versions of the classic track, Long Distance Runaround. Listen and then let me know if you agree with my assessment of the performances by contacting me via any of the different routes on the right hand side or by leaving a comment below! How is the studio version developed into a live version? What influence do different band members have on the track?